It was 23rd December and all over Facebook there were pictures of people with their X-Mas tree, posing, decorating, laughing. Earlier when we were kids my brother and I used to decorate the tree like we liked not how it should be. It was great fun. 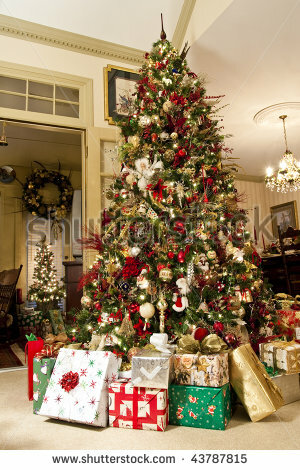 I still remember my first encounter with the X-Mas tree at the Christmas party. It was the first time that I got to know what it is and why people like it because it is a tree bearing gifts. As for a first timer I didn't know why kids went crazy when someone asked to come to the tree and since I was last I got the used crackers and the not so appreciated small gift cars :( :( My mom and grandfather tried to console me saying it's ok and we will buy what you want on our way back I was sulking. So I had a cold war with the tree. Today I don't remember anyone who was there besides my immediate family but I do remember my first X-mas tree well. It wad way too huge maybe 7 feet, installed in the hallway just as one moves past the winding burgundy staircase. Draped in decorative balls, stars and crackers with gift boxes set at the bottom. Why I remember this is because during my cold war with the tree I made a pact with myself to remember what is kept where to be better prepared next time. I have fond memories of our Christmas trees being set up in the music room, my father turning the tree until he found the best face forward. In those days there were the big colored bulbs. This is my first visit to your blog while hurrying to still read as many as possible by Saturday. I like what I have found here. While you have been busy, I have been writing about hotels and inns, the architecture and architects, the significant settings they are in. If you have time or interest, it’s not too late to come visit. I’ll be back.